The Canterbury & District Bat & Trap League welcomes you to their web site. 2012 marked the start of it’s 90th year. It is an outdoor game, played with a bat & ball on a pitch slightly shorter than a cricket pitch. In this league, the game is only played at licensed premises, so there are plenty of opportunities to visit many fine Kentish pubs (and sample the beers!) while getting a bit of exercise. We are always looking for new teams to join us in the league. If you would like details, then please contact us and we’ll see what we can do about fitting you in the next available slot. On other pages you can find the Rules, fixture lists, venue addresses, and location maps. During the season there will also be up to date results tables of the various league and cup competitions. 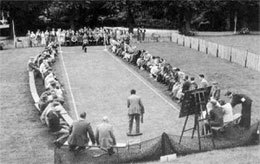 Above: Festival Cup Final – May 1954. Played beside the Dane John monument in central Canterbury. Between the Canterbury British Legion and Post Office Telephones. For the record the British Legion won the match.